These are the standard materials supplied in the Endeavor Homes owner-builder package, unless you specify other options. Upgrades are available for most items. Wood floor option (when specified instead of slab) is an "I” joist system at a minimum of 16” OC, blocked over supports and ¾” plywood subfloor and glue. This system is also used for two story homes. Girder post and vents are also included. Optional wood floor package based on level lot. /8” particle board supplied for all vinyl areas in either single or two story homes. Materials for exterior partitions are: 2x6 studs, 16” OC for all exterior and plumbing walls, and 2x4 studs, 16” OC for interior partitions. Plates are double top plates with single pressure treated bottom plate for the standard slab package. All openings are enclosed by two full length studs and two full length trimmers with headers and bearing walls. Metal strap bracing is provided where required. 2x4 plumb and align material is furnished for temporary bracing. Standard height walls are assembled at the Endeavor Plant. Sidings per plan are 5/8” Duratemp plywood composite board with T-1-1 I pattern and ½” TruWood lap siding in a rough sawn textured finish. (Hardiplank is an available upgrade option). Homes using lap siding may require shear paneling (3/8” CDX plywood or Thermoply). House wrap is provided on all homes. The exterior trim, fascia and barges are select SPF resawn lumber. Exterior trim may be a 6/4 composite material. 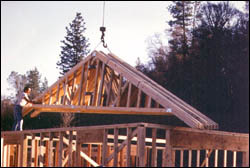 Roof systems are prefabricated trusses at 24” OC 1x4 and 2x4 bracing is provided. Roof pitches are 4/12 or greater. Roof sheathing is ½” CDX plywood with ½ CCX plywood overhang. Roofing material supplied is 30-year dimensional shingles with 15 pound underlayment felt. (40 year, 50 year dimensional shingles and metal roofing are available upgrade options. Nails, rain gutters, flashing and valleys are also included. Porch soffits will be 5/8” composite material. For two-story homes stringer material is 2x12 Douglas fir. Stair treads are 1 1/8” composite, beveled material. Risers are 1x8” Douglas fir. Homes with garages are furnished with complete overhead steel sectional roll up garage door, 16’x7’, for two car units and 8’x7’ for single car units with hardware and garage jambs. The electrical items needed to wire your home, such as 200 amp panel box, breakers, wires, receptacles, switches, face plates, stud and ceiling boxes and all other materials to complete the job, are included, according to the electrical plan. Shelves, poles, hook packages, and sliding doors for closets. Paint grade casing for doors and stools for windows. MDF baseboard for finished rooms. Dead bolts for front doors. Complete hardware for all doors. Weather stripping and threshold for exterior doors. One chrome shower rod, one chrome towel bar and paper holder per bathroom. Stainless steel double sink for kitchen with cast iron as an available upgrade option. ½” drywall is furnished for all interior walls 5/8” type-X wallboard is furnished for all ceilings and firewall between house and garage. Appropriate finishing materials, such a tape, metal corners,* (bullnose corners are an available upgrade option), premixed mud and topping are included. Interior latex flat is provided for the interior walls, enamel undercoat and enamel paint are included for the kitchen and baths only. Also furnished is the paint for the exterior siding, overhang, and trim. Stain is provided to finish interior and exterior doors. Decorative light fixtures are provided as per plan. Also included is an approved wired smoke detector system, a front door bell and button, and exhaust fan for bathroom, when needed. Medicine cabinets, toilets, fiberglass shower and tubs, mirrors, tub and sink faucets, and shower heads are included. *A custom designed heating and air conditioning system is provided which includes a heat pump or gas pack, ducts, registers, return air grill and thermostat; this is installed at no extra charge. Optional prices can be quoted for wall heaters. Carpet and ½” pad is furnished for all rooms except kitchen, entry and baths where vinyl is provided. * Endeavor Homes is not a licensed contractor but employs licensed contractors for the installation of heat and air conditioning, cabinets, and counter tops.